Libor has undergone big changes since it was subject to widespread manipulation and became known colloquially as “Lie-bor”. But it is still important — it represents short-term bank funding costs, and trillions of dollars worth of derivatives, mortgages and business loans are linked to its level. So the rise has begun to generate some chatter in the financial industry. 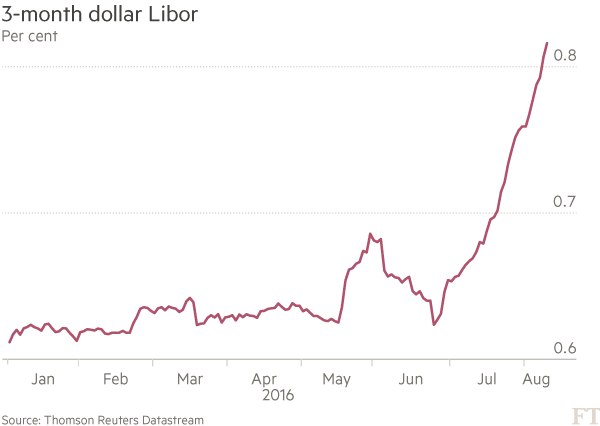 Libor climbed higher when the Federal Reserve raised interest rates last December, and was nudged up by the brief financial tremors caused by the UK’s vote to exit the EU on June 24. But the latest upward march has been caused by a long-awaited US regulatory change that is only now beginning to feed through. New rules slapped on the US money market fund industry in the wake of the financial crisis are due to come fully into effect in October. The changes have spurred a gradual investor exodus from the funds, and the conversion of “prime” MMFs which invest into corporate debt into ones that only invest in Treasuries (which are less affected by the new regulations). Funds are now hoarding cash in case of further outflows. That is in turn limiting their capacity to buy short-term securities from banks, pushing Libor higher. Bank analysts are mostly playing down the rate move, but it has the effect of tightening financial conditions on the edges. Higher Libor rates could also spur some European and Japanese banks to tap long-dormant dollar swap lines with central banks. 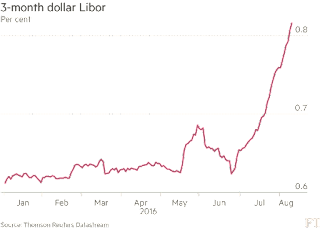 Once the October 14 deadline has passed, the rise of the Libor rise should abate. Still, keep an eye on it. Is it time for risk on again? Can I say no to LRIS? Simple theme. Theme images by sandsun. Powered by Blogger.